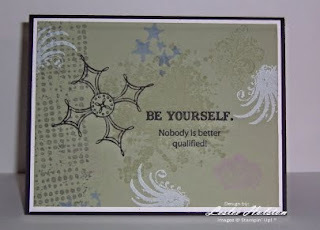 Leslee's Creative Inspiration: Be Yourself...Extreme & Serene! Fun card to make! A great masculine card and easily mass produced. And isn't this sentiment super? I certainly want my boys to know this. I love them for just who they are! The card uses three sets: Extreme Elements (background elements), Serene Snowflakes (main focal image), and Smarty Pants (the sentiment). Basic Black card base, mat of Whisper White and the main panel is Mellow Moss (a color I haven't used in awhile). The focal image and the sentiment are stamped in basic black and the elements in various colors. Now, I've been featuring the large flake from the Serene Snowflakes set. Do you see it? That's right...the main focal image! Cool huh? Picking out the graphics in this flake has been tons of fun! I simply used a basic black marker to color only the graphic image on the stamp that I wanted. This technique is known as omitting. I had cut this same image out in this previous post. I love when I can use my stamps and tools in an out-of-the-box sort of way! The card itself is a scrap card. The card stock has been hanging around on my desk for quite some time now. Rejected pieces from a previous card or project. The basic black card base was the second half of an 8-1/2 x 11 sheet of cs. I set these perfect card base pieces in a special place so they don't get bent corners. Well, I found them! Tucked between a box lid and it's bottom. I have close to three dozen of these in all colors, pre-cut and scored and ready to use. I'm going to do my best to use them---and all my scraps---before I grab for a fresh sheet of cs. Wish me luck! Well, that's it for today. Thanks for stopping in. I hope you've been inspired to look at your stamps a little differently. Turn them upside down and sideways...what do you see? Have fun and always be yourself!